Mike Ullery | Daily Call file photo Former Ohio State Buckeye teammates Dane Sanzenbacher, left, and Brandon Saine answer questions from youngsters attending the Brandon Saine Football Skills Camp at Piqua High School last year. 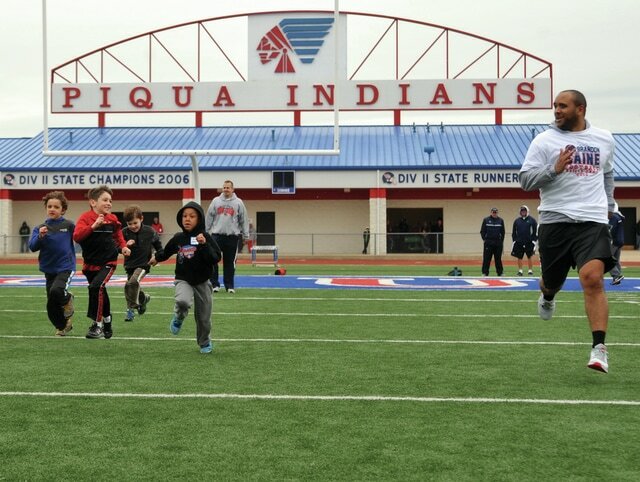 Brandon Saine and Dane Sanzenbacher time youngsters in the 40 yard dash at the 2015 Brandon Saine Football Skills Camp at Piqua High School. Brandon Saine runs 40 yard dash drills alongside camp participants. 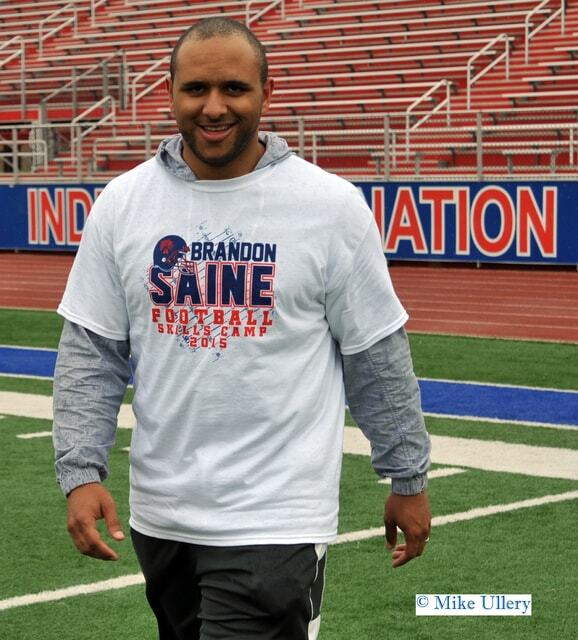 Brandon Saine Football Skills Camp at Piqua High School on April 25, 2015. Brandon Saine’s athletic accomplishments at Piqua High School are unmatched. But, what has always set the former Ohio State and Green Bay Packer apart is his ability to not forget where he came from. 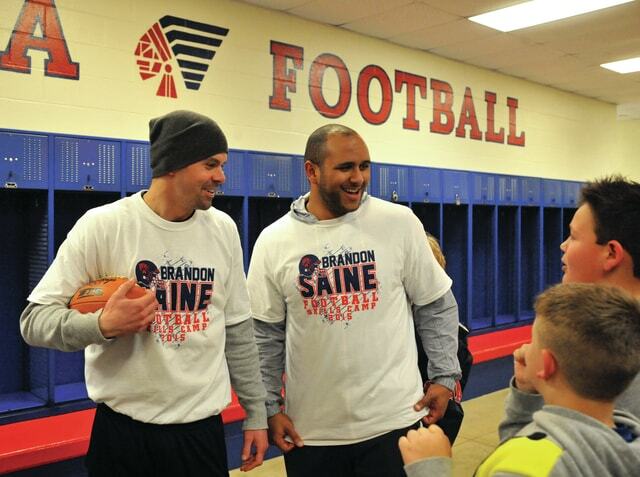 So, it should come to no surprise to those who know Saine made a decision a year ago to hold a youth football camp in Piqua — with the money going to the Brandon Saine Family Scholarship program. The second annual camp — the Brandon Saine Football Skills Camp for grades 1-6 — will be held April 30 from 9 a.m.-noon at Alexander Stadium/Purk Field. Cost is $25 per camper or $40 for two and registrations forms were passed out at all Piqua schools and extra forms can be picked up at Piqua High School. Participants need to register by April 23 to ensure receiving a t-shirt. Same day registration will open at 9 a.m.
Fee includes a t-shirt and autograph/photo session with Brandon and fellow camp instructors Dane Sanzenbacher and Bryant Browning. Campers are requested to limit autograph items to two per camper. Athletes will participate in drills that are designed to enhance football fundamentals. Campers should come dressed in t-shirt, shorts and tennis shoes. Camp will be held rain or shine. Saine also enjoys working with youngsters. Saine rewrote the record books at Piqua. He is still the all-time leader at Piqua in carer rushing yards (4,359 yards), single season rushing yards (2,287 yards), single season scoring (38 TDs, 228 points) and career scoring (59 TDs, 354 points). Saine is the only Piqua football player to receive the Mr. Football award for the top player in Ohio and set what was a D-II state rushing record for the championship game in leading Piqua to a 28-9 victory over Pickerington Central. If that wasn’t enough, Saine won three state championships in track — winning the 100-meter dash as a sophomore and doubling in the 100 and 400 as a junior. He also set a new state record for the 100 at the Edwin Moses Relays that year. He went on to play at Ohio State, where he had 1,408 career rushing yards, 616 career receiving yards and scored 17 touchdowns. Saine signed as an undrafted fee agent with the Green Bay Packers and played two years before retiring. He also enjoyed watching Ohio State win the national title in football in 2015. Saine said he is in a great place in his life right now. And, as the youth camp proves, he hasn’t forgotten where he came from. Rob Kiser is Sports Editor of the Daily Call. He can be reached at (937) 451-3334.
https://www.dailycall.com/wp-content/uploads/sites/30/2016/04/web1_042515mju_fb_phs_saine2.jpgMike Ullery | Daily Call file photo Former Ohio State Buckeye teammates Dane Sanzenbacher, left, and Brandon Saine answer questions from youngsters attending the Brandon Saine Football Skills Camp at Piqua High School last year. https://www.dailycall.com/wp-content/uploads/sites/30/2016/04/web1_042515mju_fb_phs_saine3.jpgBrandon Saine and Dane Sanzenbacher time youngsters in the 40 yard dash at the 2015 Brandon Saine Football Skills Camp at Piqua High School. 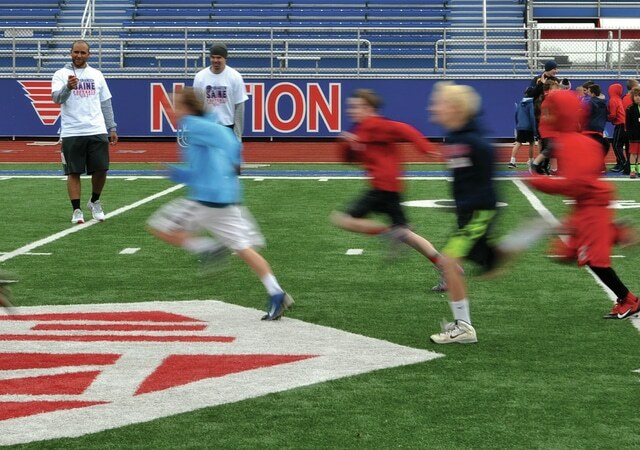 https://www.dailycall.com/wp-content/uploads/sites/30/2016/04/web1_042515mju_fb_phs_saine4.jpgBrandon Saine runs 40 yard dash drills alongside camp participants. 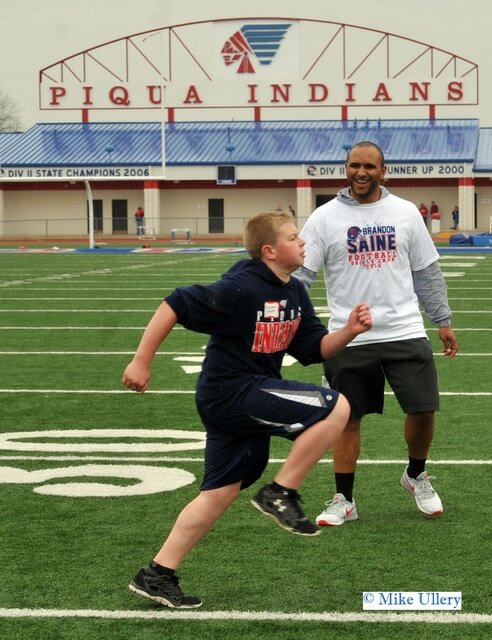 https://www.dailycall.com/wp-content/uploads/sites/30/2016/04/web1_MJU_9492.jpgBrandon Saine Football Skills Camp at Piqua High School on April 25, 2015.
https://www.dailycall.com/wp-content/uploads/sites/30/2016/04/web1_MJU_9494.jpgBrandon Saine Football Skills Camp at Piqua High School on April 25, 2015.